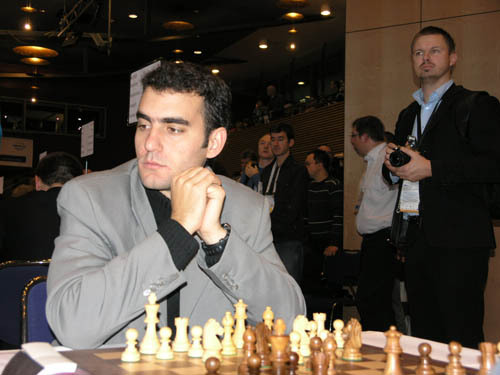 Round #9 Analysis: Before the tournament, practically every chess pundit and journalist picked Russia to win the gold medal primarily because of the powerful individual players with an average rating of over 2750. Even others who did not pick Russia for the gold, felt they would at least win a medal. 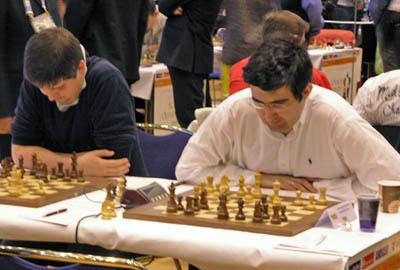 Peter Svidler and Vladimir Kramnik failed to save Russia’s medal hopes. 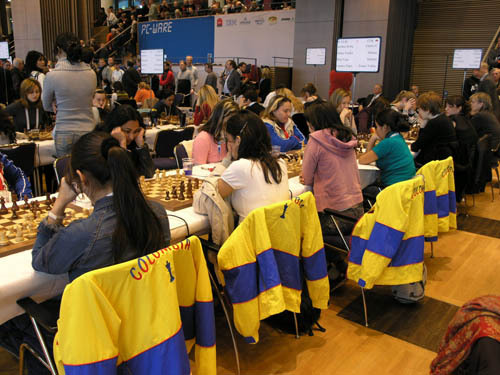 After Russia’s loss to Ukraine and virtual elimination in the medal race, Anatoly Karpov mentioned that there is something missing in Russian chess. Of course, it is not the players, but it is a void of leadership according to the former World Champion. It is apparent that the “board stacking” of putting Alexander Morozevich (2787) on board #4 has not paid off. Russia was in trouble early, winning by the slimmest of margins and faltering in the second half of the tournament. The federation will have to rebuild around Dmitry Jakovenko, Alexey Alekseev and Ian Nepomniachtchi. As for the Russian dominance… it is dead. When asked about the tradition of Russian/Soviet dominance, GM Alexander Khalifman stated in the press conference that perhaps it is good not to have one dominant nation since that chess gains from a shifting of balance of power. Certainly that is happening. Armenia had gone into today’s match without losing a game, but Boris Gelfand of Israel took care of that with a win over Levon Aronian. This would serve as the margin of victory and now Israel sits atop the field by a point. They’ll get Ukraine tomorrow. In another turn, Azerbaijan was virtually eliminated from medal contention with another loss, this time to a solid Serbian team. Azerbaijan has not had good chemistry and internal tension continues to damage one of the most talented teams in the world. China has put itself in a wonderful position to play for the title, after smashing France. 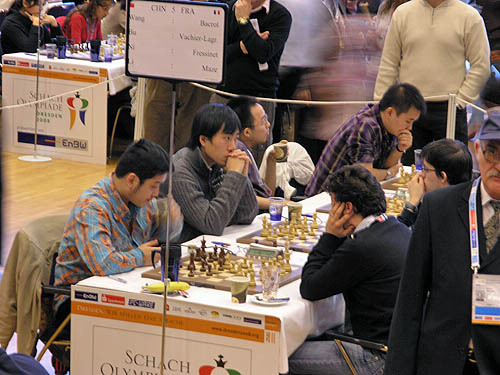 In the press room, the Chinese could be seen happily checking the progress of the other games in order to gain a match strategy for tomorrow and the last round. They will play England, who they destroyed in the China vs. England match last year. 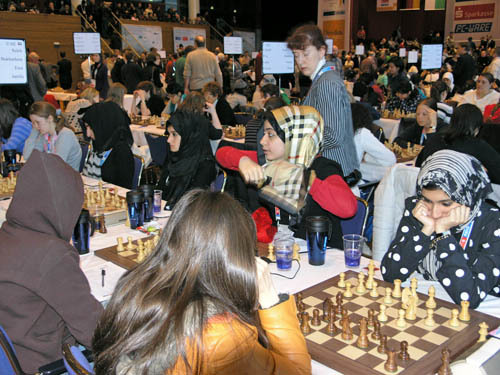 In the women’s tournament, a turn of events has occurred. The Ukraine has come roaring back to take the tournament’s lead after beating Romania 3-1. 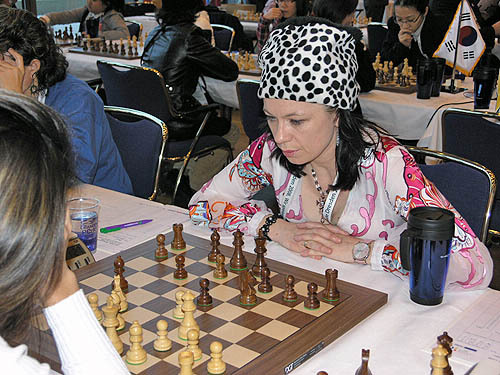 After drawing in the first round, the Ukrainian women have clawed their way back into contention while the others have beaten each other up. China suffered its first loss today after falling to a determined Serbian team, 2½-1½. Both Serbian teams are exceeding expectations. Poland crushed the USA 3-1, a team coming off of a huge win over the Soviet Union. The Polish and Serbian teams are in a virtual tie for first place. China drops a point off the pace and will have the toughest test when facing Georgia tomorrow. What is interesting is that only two points separate the top ten places. With two rounds remaining, medals are there for the taking. One medal for the taking is Oleiny Linares Napoles of Cuba who is 8.5/9! 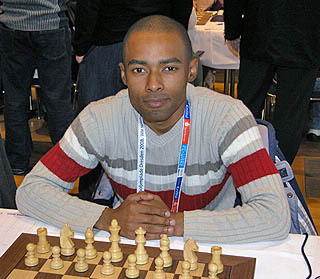 African Diaspora: IM Watu Kobese of South Africa continues to have a solid showing with a win over GM Eduardo Iturrizaga of Venezuela. He may have a chance for a GM norm. Egypt’s Bassem Amin has been the star of the Egyptian team, but the real killer has been Khaled Abdel-Razik who is on 7/7! His performance rating is a gaudy 2929! These are two bright spots in addition the brave stand Zambia is making in defending each match beginning 0-2. Both Amon Simutowe and Daniel Jere have 6.5/8. 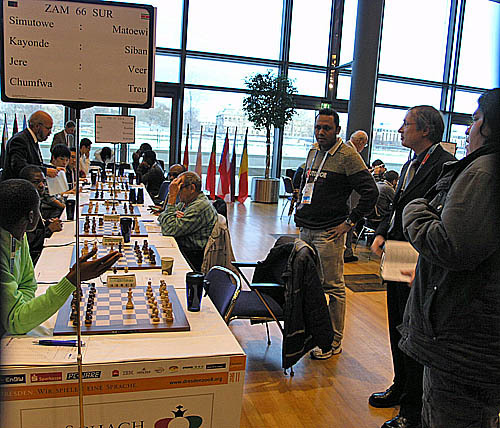 after arbiter (right) forfeits Suriname’s Roger Matoewi. 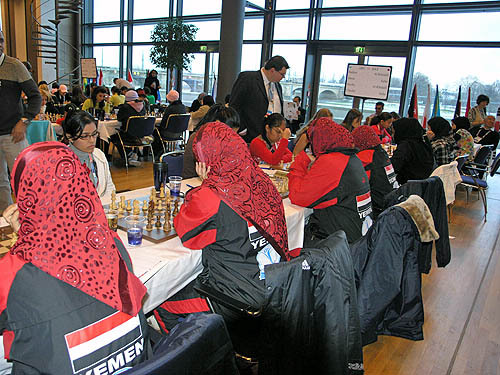 Yemeni women always come to the Olympiad with impressive uniforms. Here is a front view! when they wore smart blazers. Columbia women proudly displaying the colors. 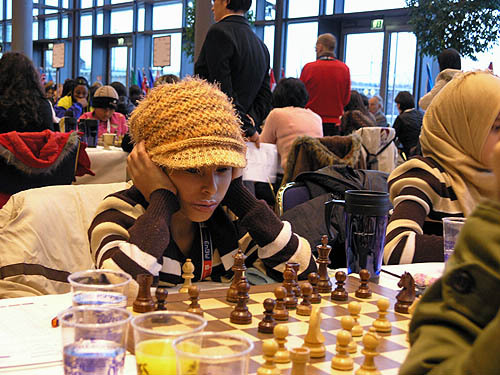 Libya’s Khawla Elfelo looking fashionable in the hat! with the blue and gold braids. 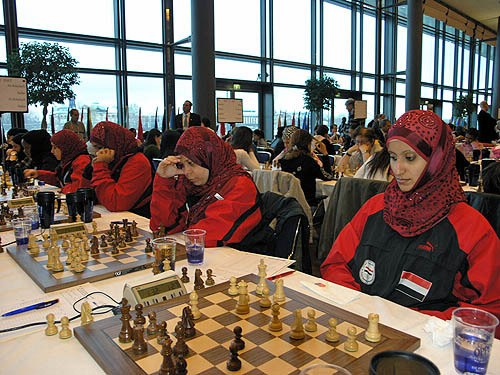 The darling of photographers in 2006, UAE continue to set the fashion trend. 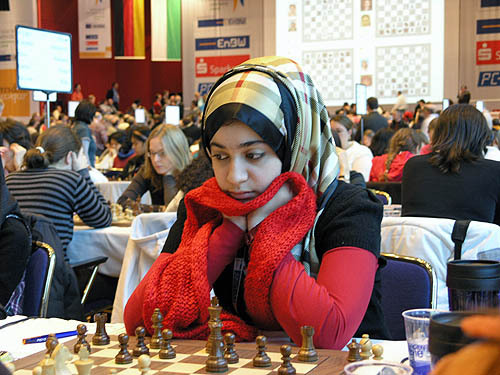 Essa Khaloud had henna on her hands in 2006. This year she’s rockin’ a Burberry hijab. GM Pontus Carlsson has the hip-hop style goin’ on! China enroute to beating France 3-1. Notice the different expressions from China. All Round #9 photos here! Great report and pictures. 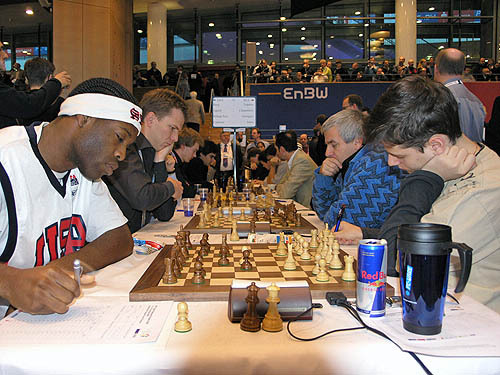 It would be nice to see one Nigerian player on the scene, I am beginning to doubt whether they are in Dresden ( :D) since I never been able to sight them on chessbase or other sites! No… I have some pictures today (my 3rd day here). The hall here is very large and it is very difficult to get around in the crowded and tight space. It is very congested. It’s also difficult to find out where all the teams are. I’ve got some pictures of the Nigerians, but will be up in round #10. Did you notice that the automatically generated PGNs and live games are only 95% correct? 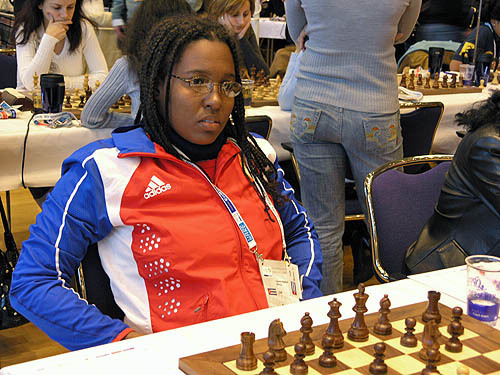 In round eight, Mudongo Boikhutso lost her queen according to the PGN, nevertheless the game ended in a draw?! But with some thinking the real course of moves can be reconstructed. The main site had lots of errors in the games. TWIC is probably the most relibale because Mark Crowther has been cleaning up the files. I have stopped using those games since the 2nd round. 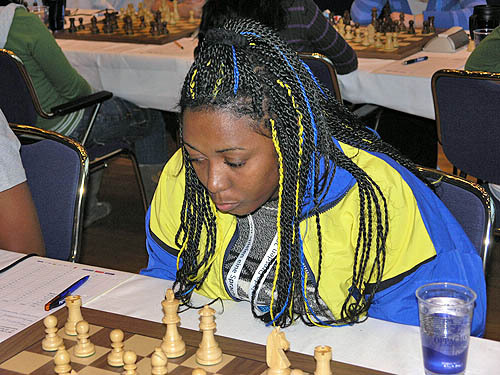 Great pics but that is Juanita Garnett of Barbados in the braids not Katrina Blackman.